Our Fusion fitted and combination furniture is the perfect solution for smaller bathrooms, where every centimetre counts. It’s also just the thing for larger rooms where you wish to maximise storage and maintain those crisp, clean lines. Most of our fusion furniture is made here in Britain by our master furniture makers. Easily maintained and hard-wearing, our furniture is supplied rigid for easy installation and features a full 5-year guarantee. Soft-close doors and hard-wearing drawers are fitted as standard to keep your pieces in tip top condition for years to come as well as ensuring peace and tranquillity is carried throughout your home. Our wide palette of colours reflects the very latest in tonal trends as well as traditional favourites. We take colour and finish co-ordination to a new level for a perfectly harmonious look. Combine your units with a choice of slimline, l-shape and full depth basin designs. Our ceramic basins won’t fade or discolour and will be a great colour match for your toilet. Poly-marble basins ensure a crisp, super smooth finish and are incredibly durable. 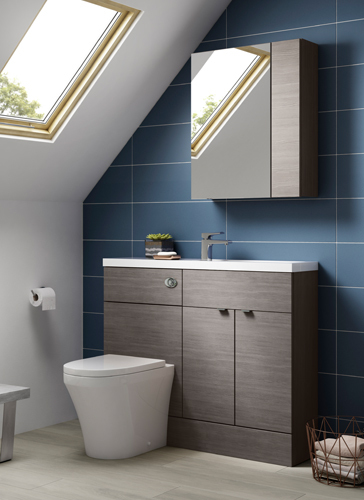 Our slimline furniture is the perfect choice for en-suites and smaller bathrooms. The compact design and smooth polymarble basin, provides the perfect balance of storage of style for the minimal bathroom space. Choose from crisp white, or rich grey avola from our distinctive colour palette. Choice and flexibility are the essential components of our fitted bathroom furniture. Create a streamlined run of furniture with an emphasis on maximum storage and minimum clutter — perfect for those with more bathroom space. 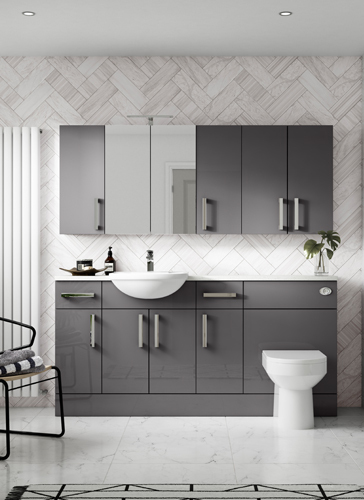 Choose our stunning gloss grey finish with co-ordinating bath panels to create a clean, graphic look. Complete you bathroom look with a choice of eye catching handles and worktops. From minimalist white gloss counter tops to striking sparkling handles, we have a vast range to meet your requirements.